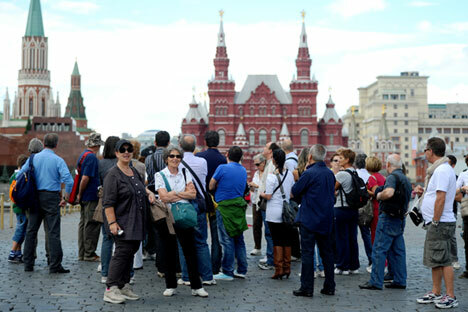 Tourists take pictures of the State Historical Museum in Moscow's Red Square. British broadsheet includes Muscovite in list of best trip advisors. A Moscow tour guide with years of experiencing helping tourists discover the Russian capital is among the world's top ten, according to the Guardian. Felix Maltsev is an employee of Patriarshy Dom Tours that offers a wide range of thematic tours from the city's Stalin and Jewish past to the Moscow of Bulgakov's The Master and Margarita. "His enthusiasm for the city’s palatial metro system or the grimmest Soviet memorials has provided generations of visitors with a unique way into Russian culture and history," the Guardian says. "I think Felix, in many ways, is one-of-a-kind ... he is the kind of book-lover who will translate Russian poetry himself for his clients rather than read what he considers a substandard translation," Guardian contributor Phoebe Taplin, who picked Maltsev, told RBTH. "He is far more than a guide, really; to many people living in Moscow, he is a guru and teacher, " she added. According to Taplin, Maltsev is not unique. "Many of Felix's fellow guides at Patriarshy Dom are also old-school intellectuals as are many other Russians working in museums and libraries, as guides and teachers. This is one of the things that those of us who love Russian culture prize so highly about the country," she said.